Club Penguin Cheats by Mimo777 Club Penguin Cheats by Mimo777: Club Penguin Series 7 Plush Toys Available Soon! These are so cool! You know what this means, right? Treasure book # 7 will be here soon! Saweet! You may recognize some of these toys from a previous series, but, except for Aunt Arctic, these toy are different colors, so they ARE new! I really like the Secret Agent plush! Which one is your fav? 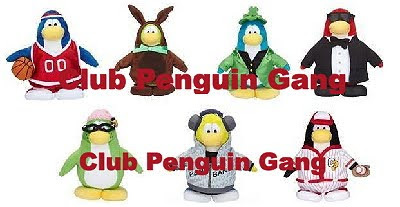 Don't forget, you can check out all Club Penguin Toys here. Secret Agent 1 is the best i think! I love the Secret agent. Yeah, I like the the Secret Agent one. I like the secret agent which also helps us with Herbert's Revenge showing it will come out. Also the basketball one and the baseball one are pretty kool. Peace, Relax, and be a Zebra! the secret agent is too cool!!! Secret agent, but they need a ninja! hey i like the agent 2!! but all the items they where have been released. except the hat for the leprechaun? does that mean that the hat might be saint Patrick's day item? i like the guy with the head phones on! he rocks! I like the baseball guy and the secret agent! Perhaps.. guess we'll just ahve to wait and see! Yeah. It might be. You got a good idea there. I love that show! I don't really see a reference though. omg i cant belive i have one!!! hey! we already have some of those here in the UK! They already have a ninja! I think the bunny is cute but I don't think I can get them. AMERICA will have them sooner or later. i like the agent too. i wish they would make a costume that was a platypus... that would be funny... maybe for april fools? Oh yeah! that's what we're all thinking right now! xoro619 said... i love the secret agent. Isn't it Shamrock Hat which was given last year? It's released, too! Really? Did you try to unlock? And you got series 7 Treasure Book? Let us know! Sweet! I love the Penguin Band dude Club Penguin is REALLY updating!!!! You are right, they do need a ninja. I know what happened. I could just tell him. The same here. CP sometimes has the old pin and sometimes the new pin! it's so irritating! i usually lose connection and it makes me mad. cp should fix the problem soon. Mimo! if you go to the stage and wait a yellow puffle will appear in a boat! Aunt Arctic is best cuz if you have her plushy.Maybe we'll have her items in treasure book. ~~~~~~~~~~~~~~~~~~~~~~~~~~~~~~~~~~~I think that was already an item. You sure thats a new server? I have 4 of them! Lol I live in the U.S.
really? I didnt know that mimo make this guy a mod! Unfortunately you can't just ask to be a Mod and become a Mod. You have to earn it. You can become a Mod by answering peoples questions nicely and fully. You repersent mimo and all he stands for. Finally you end all your answers with "Your Name" (CPG MOD) Good luck and hope to see you on the List soon! Yes they are! with a new puffle and friday updates now thursday afternoon updates! AND in real life, with new puffle/penguin plush toys, new books, AND a new video game! Clubpenguin is going all out! I like the secret agent one mimo and the penguin band hoodie one. Sorry, thats an old server. Its been around for a while. Awww i'm sorry to say this but Rainbow has been a server for a while. next time you find something New, be sure to come and comment again and Mimo will post it if he hasn't already. Yes, I think so too! I really like the basketballer! Rainbow is an old server. Also, don't use so many !. I think all of them are sweet! I'm excited bcuz maybe we will be able to unlock Aunt Arctic's clothes! I have a coin code for the pajama penguin. Will I be able to unlock an orange puffle when it comes out? I really want to.